As spring begins to take hold it will soon be time for one of my favourite pond creatures to make its presence felt. 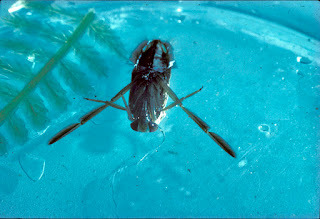 This is a Greater Waterboatman, called the backswimmer in North America, one of the aquatic bugs. They are common enough, emerging from a net scoop of weed and debris with a twitchy, gangling urgency or to be watched hanging under the surface film of a pond, the occasional subtle scull to shift them in search of victims. They are predators, snatching prey with the first two pairs of legs and using that elegant proboscis you can see in the picture extending back from the head, to skewer prey and digest their innards. They are especially good at dispatching other insects that have got snarled in the meniscus or that bumble around at the surface. Amphibious beetles such as Helophorus are particularly vulnerable. The beetles have hard exoskeletons but the waterboatman stick their proboscis between the beetles’ head and thorax, resulting in a characteristic decapitation that you can use to count attacks as the forlorn, headless beetle bodies accumulate. Much like an expert wine waiter using a corkscrew. Mosquito larvae which need to rise to the surface to recharge their air supply or water fleas, twitching in the water column, are also an easy meal. So voracious are the waterboatmen that they can exterminate their chosen prey from small ponds, eventually turning cannibal when all the easy meals have been exhausted. Female waterboatmen lay batches of eggs on plants or stones (this varies a bit with species), which hatch into black specks of nymphs, rowing urgently in search of tiny prey or to avoid their older cousins. keep an eye out over the next few weeks as the race to eat and not be eaten hots up.